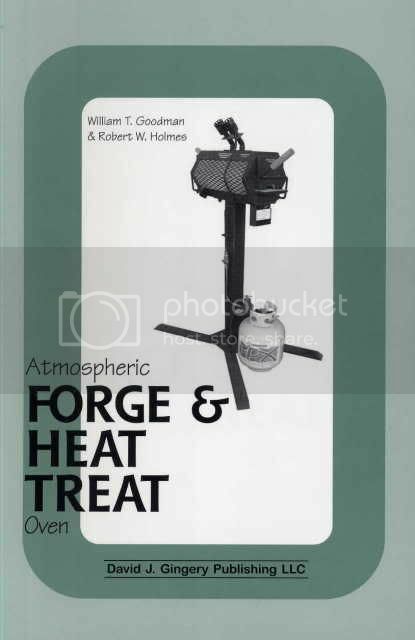 A very well done book on building an double end door, forge or furnace oven. goes from cold start to 2,500'F in 2 1/2 minutes. has twin burners operates on LP Bottle gas from 1 1/2 psi to 8 Psi pressure. The height is 5' 2" tall at the top of the burners putting the viewing area at a good height to see what is happening. It is an easy build with mostly common shop tools. Has a Pryometer for those temp reading in heat treating. The other advantages to this style is with the design of the burners. The primary air volume increases as the pressure and volume of the gas increases. So there is no air shutter adjustment. So no fan or blower, so no electric hook up required. Perfect for a traveling forge. Have a 100 pounder tank and you are good to go for awhile. The openings are 6"x6" and the chamber is 22" long. you can pass long stock, you can heat two or more at once. Or have two people working at the same time. as in a school or teaching, demo. This is one well thought out piece of equipment. It can do the work of a couple of different furnaces or forges. I haven't built it yet as the book is new to me it has the parts list breakdown. It shows you how to cast the block for the forge so there is no looking for obsure maker or type of fire brick. Lots of B&W photos that are clear and bright so you can see the item. The drawing are detailed cleanly done with all angles in place with the measurements. I think I have found the one I'm going to build when the time comes.